Whether you have a patio, a deck, or just a small patch of grass in your backyard, summer is the perfect time to upgrade your outdoor space. 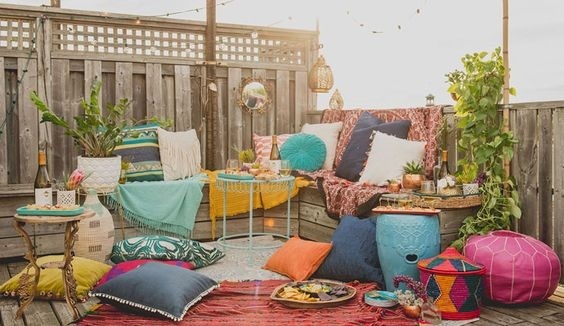 Without going overboard (or breaking your budget), these tips will help you make the most of your backyard entertaining environment! Plain furniture can easily be transformed by introducing vibrant, summery colors with pillows, throws, and other accessories. You can even use a mix of colors, just remember to keep things cohesive by sticking to a defined color scheme. Plants and flowers are a simple way to bring your outdoor space to life. Try placing greenery in mismatched pottery for a quirky twist, or adding faux grass to a fence for an all-natural look. One of the biggest trends in outdoor decorating today is incorporating a traditional indoor setup into your exterior space. Recycle any durable pieces of furniture you have inside to for the backyard and won’t need to splurge on a new table and chairs set. A little paint can go a long way in completely transforming a space. You can use exterior paint and painter’s tape to create a faux patterned rug, a unique design on a worn-out fence, or to make-over an old piece of furniture—the possibilities are endless. Utilizing a theme for your outdoor area can make finding key pieces a breeze. Deciding between a tropical feel, country charm, or urban oasis can make the difference between a pleasant decorating experience and a stressful one.